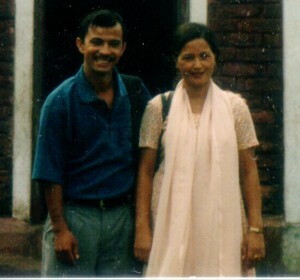 Biography: In 1989, in the mountainous region of Jhapa, East Nepal, a strong Hindu region, God gave Jiwan Shrestha a vision and a burden of love to go and preach the Gospel to the village people. No Christian work had ever survived there before. Today there are nine churches using cell groups to equip the saints and nine evangelists to continue the growth. The church has over three hundred dedicated Christians in a society that is heavily anti-Christian. Jiwan, along with two associate pastors, two youth pastors and nine full time evangelists, continues to celebrate God's goodness. Strengths: Hosanna Church has a strong commitment to reach a lost world for Christ and to minister to the needs of the villagers on all levels. Family: Jiwan and Esther have two children, Sophia and Selena.